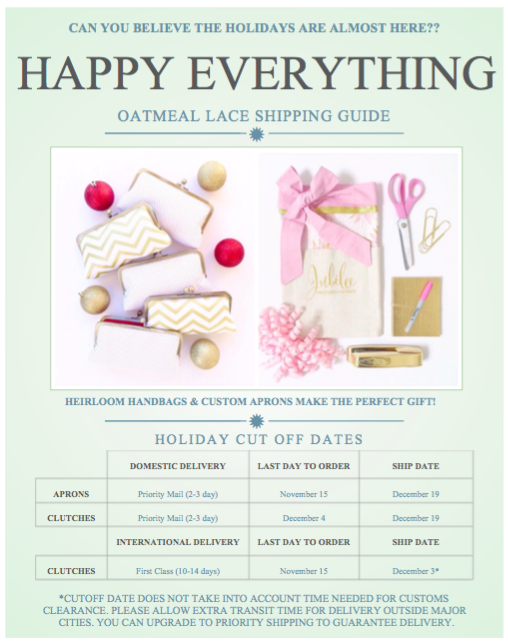 oatmeal lace design: ordering for the holidays! since time is of the essence in regards to getting our holiday wish lists together (HOW IS IT ALREADY MID NOVEMBER?!?!?) I decided what the heck and reused my shipping deadline outline from last year. less headache for me + quicker information to you all, my dear reader(s) = everyone stays happy. these dates are all based on PRIORITY MAIL shipping, so if you are willing to pay for express you have a couple days leeway on ordering. just a thought to keep in mind! you can click HERE to start shopping. happy holidays everyone! ps- any questions for me or if you have a logo you'd like to get quoted, email me at hello@oatmeallace.com.